Toronto (October 6, 2016) – The European Bioinformatics Institute (EMBL-EBI), the New York University School of Medicine and the Ontario Institute for Cancer Research (OICR) today announced a major milestone in the Reactome project: the annotation and release of its 10,000th human protein, making it the most comprehensive open access pathway knowledgebase available to the scientific community. Reactome relates human genes, proteins and other biomolecules to the biological pathways and processes in which they participate. It is a key resource for the biomedical research community, and is widely used by scientists around the world to interpret high-throughput experiments in genetics, genomics and proteomics. 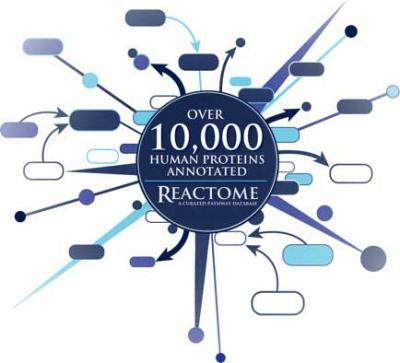 The human genome contains roughly 20,000 protein-coding genes in total, so the annotation of the 10,000th protein means that Reactome now covers half of the protein-coding portion of the genome. "We are pleased to reach this milestone and to share the results with the research community," said Dr. Lincoln Stein, Interim Scientific Director of OICR, Director of OICR's Informatics and Bio-computing Program and a Principal Investigator on the Reactome project. "Today's release, which is the result of over a decade of hard work and collaboration, will help researchers in their effort to better understand how genomic variation leads to diseases like cancer, to develop methods to detect those diseases at an earlier stage and to treat patients more effectively." Henning Hermjakob at EMBL-EBI and Peter D'Eustachio at the New York University School of Medicine are also Principal Investigators on the project. By relating genes and proteins to normal and abnormal biological pathways, Reactome provides sophisticated tools for identifying patterns in large datasets. For example, researchers can explore an experiment in Reactome that identifies thousands of genes involved in a disease, and reduce the data to a more targeted set of pathways for further study. By combining the resulting dataset with other resources, they are well placed to identify drugs and protein targets that might reverse undesirable pathway alterations, or discover ways to diagnose the disease at an early stage. Via its website, online tools, and specialized visualization and analysis applications, Reactome has been incorporated into more than 400 third-party genome analysis tools, and has been cited more than 4,000 times in the scientific literature. "Congratulations to the Reactome team on this major milestone," said Reza Moridi, Minister of Research, Innovation and Science. "Through international collaborations such as this, Ontario researchers are making great strides in fighting disease on a global scale and I look forward to witnessing ongoing success with transformative discoveries that impact the lives of Ontarians every day." Reactome has been in continuous operation since 2004, and is an international collaboration between the Ontario Institute for Cancer Research in Canada, New York University School of Medicine in the United States, and EMBL-EBI in the United Kingdom. It is staffed by expert biological curators, bioinformaticians and computer scientists. Much of the content in Reactome is provided by community authors and peer reviewers, who are assisted by curatorial staff. Reactome content, including pathway data and the software infrastructure, is available to everyone, free of charge, under a Creative Commons open access license. Reactome is supported by grants from the National Institutes of Health in the U.S., the Ontario Research Fund, the University of Toronto, OpenTargets, Genome Canada, and the European Molecular Biology Laboratory (EMBL). OICR is an innovative cancer research and development institute dedicated to prevention, early detection, diagnosis and treatment of cancer. The Institute is an independent, not-for-profit corporation, supported by the Government of Ontario. OICR's research supports more than 1,700 investigators, clinician scientists, research staff and trainees located at its headquarters and in research institutes and academia across the Province of Ontario. OICR has key research efforts underway in small molecules, biologics, stem cells, imaging, genomics, informatics and bio-computing. For more information, please visit the website at http://www.oicr.on.ca.